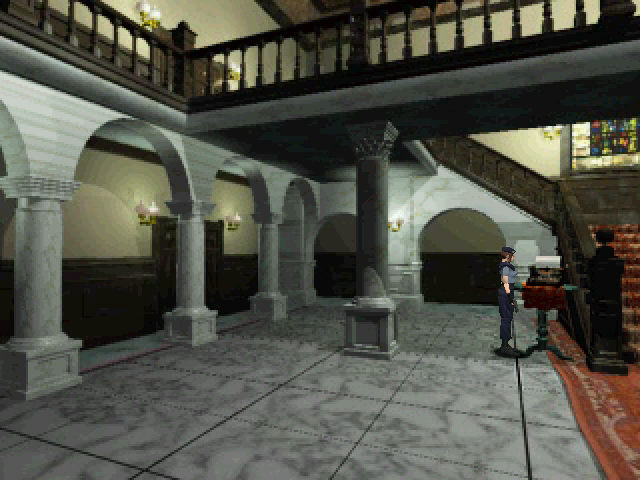 Resident Evil for the PC came as something as a rage for PC ports of Sony PlayStation games. Unusually for its time, it required a 3D accelerator. Like Tomb Raider, it was originally released for the PlayStation and Sega Saturn. The PC port is memorable because it is the only English version with fully uncensored FMVs. All non-Japanese PlayStation versions have an opening FMV edited and in B&W, and the FMV where the zombie is shown eating Joseph is also cut to remove Joseph's severed head falling to the floor. In the PC port, the intro FMV is in full color, and both FMVs are uncut. 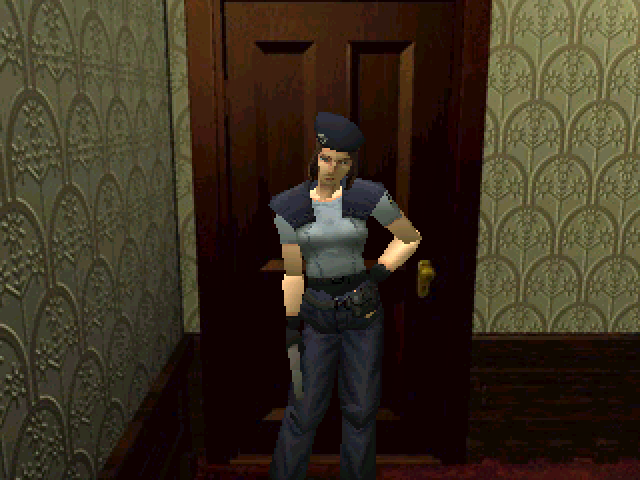 However, if you are seeking a pristine original PlayStation experience, note that in Jill's game there is unlimited saving (no typewriter ribbons are available) and Chris finds three typewriter ribbons in the PC version as opposed to two in the PlayStation version each time he finds them. The PC port requires Windows 95 or better, and all sound is digitized. Input will work with any gamepad that can report the number of buttons to windows and the buttons are freely assignable. Since almost the entire game can be installed to a hard drive, loading times can be kept to the absolute minimum. Graphics resolutions of 320x240 and 640x480 are supported, and can be run only in full-screen mode with the U.S. CD. Regardless of selected resolution, all the 2-D backgrounds and FMVs use an effective 320x240 resolution. Only the 3D polygon graphics will show quality improvements. There is a European patch that will allow systems without a supported 3D accelerator to play the game, but the results are neither pretty nor fast at the high resolution on 1997-1998-vintage systems. However, it will allow you to run the game in a window. It supports 320x240 and 640x480 in either full screen or window mode, or 640x480 full screen with 320x240 resolution polygons. There is also a Voodoo 2 patch, but I am not sure if it is necessary to use it at all, unless you have a Voodoo 2 card. The second issue is a crash bug just after Jill encounters the first zombie. When she returns to Barry, the game will freeze after Barry kills the zombie. One way around this is to use a slowdown utility like Throttle/Winthrottle. Another may be this method : http://www.vogons.org/viewtopic.php?f=8&t=9978&hilit=resident+evil+crash. I have a save game that I found a long time ago where Jill saves just after the next cutscene with Barry (in the main hall). For my Win 9x system, which is a Pentium III 600E, I set the CPU speed to 400MHz by using a 66MHz FSB. (6 x 66 = 400). Then I use Throttle to reduce the speed by 50%, and the cutscenes are in sync and no crash bug. 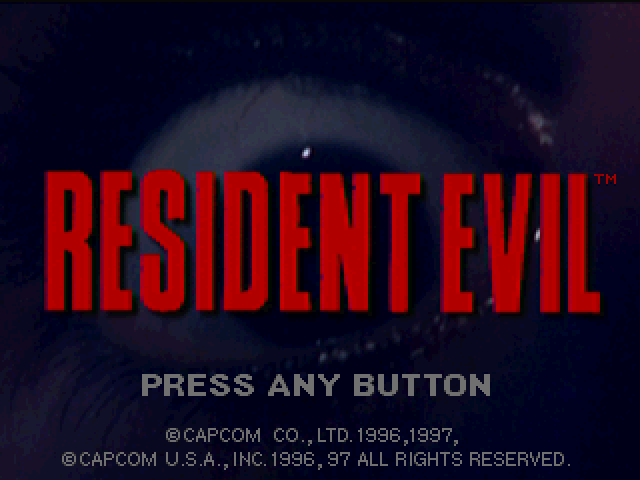 Resident Evil will save screenshots by pressing the Print Screen key to its own directory, no need to paste in Paint with Ctrl + V unless you are using a software mode. 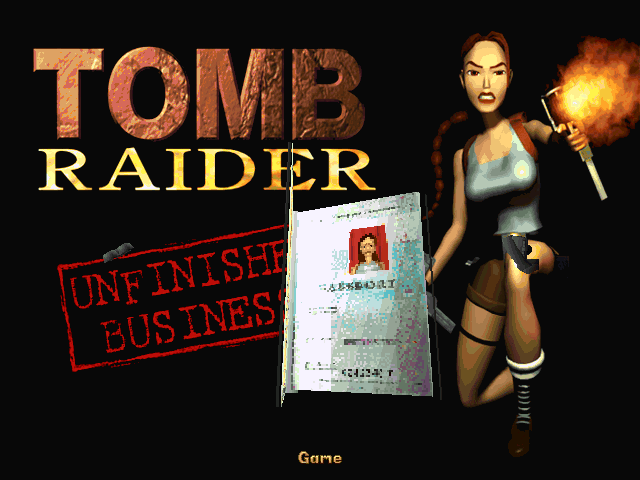 The original Tomb Raider, developed by Core Design and released by EIDOS, worked just fine in a DOS or Windows 9x system, but when Windows XP became the prevalent operating systems, it became more and more difficult to make it work. With Windows XP, it was mainly an issue of getting the sound to work. However, with 64-bit Operating Systems, it is not playable at all. Today, you can buy it on Steam, emulate it via Glidos (for $10, demo available) or emulate it via DOSBox (for free). 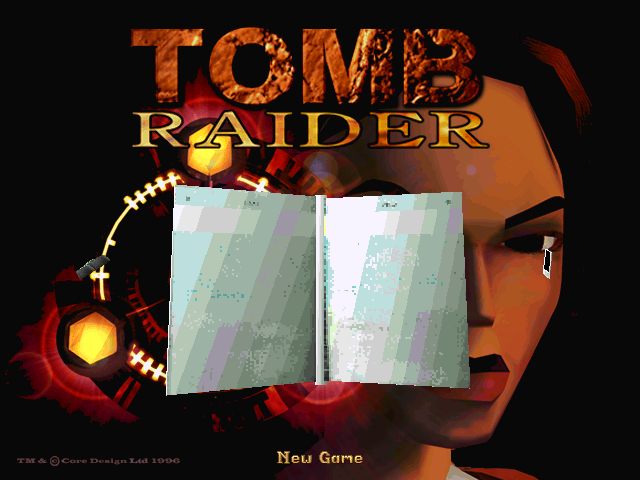 Tomb Raider PC was released alongside versions for the Sony Playstation and Sega Saturn. The PC version had certain enhancements and limitations compared with the console versions. The PC advantages include an optional 640x480 resolution mode, faster loading times, the ability to save anywhere and at virtually anytime, more configurable controls and support for the Unfinished Business add-on. The PSX and Saturn display better FMV quality, output better quality sound effects, have support for more than four buttons on a gamepad and a greater variety of music that is heard when certain triggering events occur in-game. Out of the EIDOS-trademarked trapezoid box the PC version supports standard 320x200 VGA graphics and 640x480 SVGA/VESA graphics. The game was built for a Pentium, and while a lower end Pentium can handle the low resolution graphics just fine, even a fast Pentium MMX will have some slowdown with the high resolution graphics. Both graphics modes can show fewer pixels to increase speed, each press of F2 reduces the effective graphical resolution by approximately 10% compared the "full screen". F3 cycles in reverse. EIDOS released patches to support many of the new 3D accelerator cards that were available in late 1996 and early 1997. There are patches for the basic Tomb Raider game for the 3dfx Voodoo Graphics, ATi Rage Pro 3D, Matrox Mystique, NEC Power VR, Rendition Verite, and S3 Virge. The 3dfx and NEC cards were 3D-only accelerator cards that worked in tandem with a separate 2D card. They often boasted better performance than the other 2D/3D cards against which they were competing. The Voodoo Graphics chipset was most often found on PCI cards like the Diamond Monster 3D, the Orchid Righteous 3D and the Canopus Pure 3D. The first two came with 4MB of EDO DRAM, the latter contains 6MB of EDO DRAM. The most common Power VR chipset is contained on the Videologic Apocalypse 3D, 3DX, 5D and Matrox m3D, which use 4MB of SDRAM. The original Apocalypse 3D uses the PCX1 chip, while the others use the faster PCX2 chip. The Mystique and Virge were especially notorious for poor feature sets, performance and drivers. The ATi card was decent. However, the ATi patch is unique because it contains a true Windows executable for Tomb Raider. This allows it to run without any DOS sound card configuration and allows the full selection of buttons without a keyboard to joystick mapper. 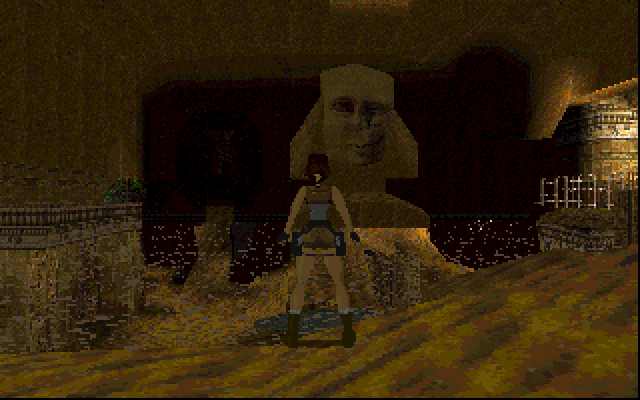 It also supported 800x600 graphics in Tomb Raider. The Verite had some good early 3D game support with its custom APIs, but the company's inability to release competitive products alongside 3Dfx and nVidia consigned the Verite architecture to obsolesence. A 3Dfx Voodoo Graphics (Voodoo 1) card brings many additional features to Tomb Raider. The game uses a 640x480 resolution with the Voodoo patched-executable. It is far more fluid than the software 640x480 mode. Tomb Raider maxes out at 30fps, and you are much more likely to obtain 30fps on vintage hardware with a Voodoo than without. With a Pentium II, the game can play buttery-smooth. The Voodoo graphics makes the game look far better than the console versions. It adds 16-bit rendering support, bilinear filtering, mip-mapping and anti-aliasing. The Power VR patch looks superior to the Voodoo, supports 800x600 and 1024x768 and 60fps, but requires a much faster CPU. The Voodoo, the Power VR and ATi Rage Pro 3D have Unfinished Business patches, other 3D accelerators do not. As the Voodoo cards were by far the most widely adopted of the early 3D accelerators, this blog entry will focus on them. The other 3dfx Voodoo-compatible retail chipsets include the Voodoo Rush, Voodoo 2, Voodoo Banshee, Voodoo 3, Voodoo 4 and Voodoo 5. The original Voodoo, the Voodoo Rush, the Voodoo 2 and the Voodoo Banshee were made by a wide variety of board manufacturers, but from the Voodoo 3, the boards were primarily built by 3dfx, which had bought STB systems to obtain access to manufacturing capabilities. There are some differences depending on whether you are playing on a true Voodoo 1 or a later card. For the basic game, there are two patches for 3Dfx cards. One works only with Voodoo 1 cards, the other works with all Voodoo cards. The latter patch is sometimes referred to as the Voodoo Rush or Voodoo 2 patch, but will work with any 3dfx chipset. Both patches are named TOMB.EXE. The Voodoo 1 patch has a size of 1,140,735 bytes and a CRC32 of 0288F887, and the Voodoo Rush patch has a size of 873,739 bytes CRC32 5A17B7F3. The original Voodoo patch suffers from high gamma levels, partially to offset the rather low-lit environments. This, combined with the VGA passthrough cable, tends to show the Voodoo 1 graphics in a relatively poor light, quality-wise. The combined 2D/3D boards do not have this problem, and the visual quality for the Voodoo 2 passthrough should be improved. The visual quality is excellent with my Voodoo 3 card. 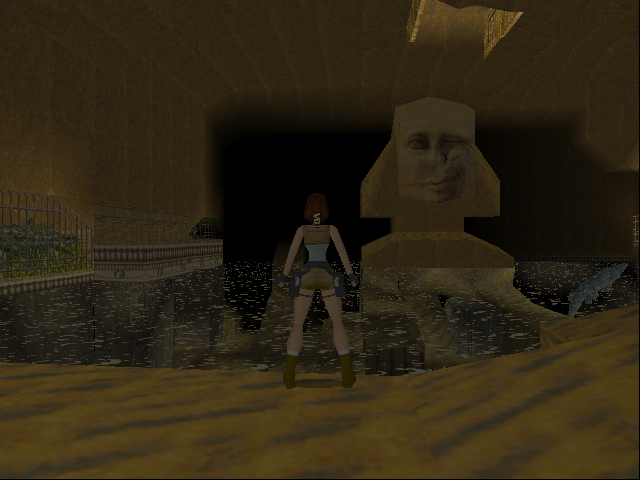 With a Voodoo Rush or better, you may see a white outline around Lara's pistols, their discharge and her left hand. Disabling the anti-aliasing with F3 will remove it. Custom DOSBox builds with Glide support may show black outlines. Also, the mip-mapping feature will show "seams" in the surfaces on real hardware, so I would not advise using it. I don't know whether this will be seen with a real Voodoo Graphics card. For the Unfinished Business addon, there are two Voodoo patches. The one that works with the Voodoo Rush, 2 and later 3dfx cards, despite what the readme file may say, and has a file size of 867,563 bytes and a CRC32 of EBFBFEAD. This works with the same data files as the software-render only executable. There is another patch floating around with the same file size but a CRC32 of 61E47504, this one may only work with the original Voodoo 1 graphics cards. Glidos can improve the quality of the FMVs to Playstation levels with a downloadable pack, but this has not been integrated into the original DOS version. There are also several texture enhancement packs available for Glidos, but not all cover the full game. I have all the patches mentioned here, some of which can be hard to find. If anyone needs a particular patch, contact me. 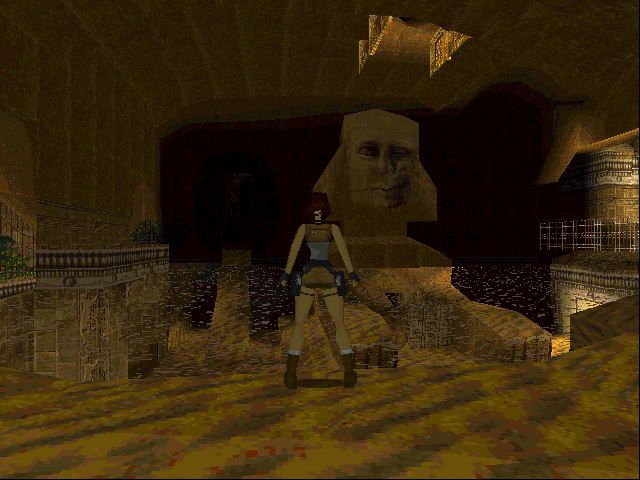 Tomb Raider, while a DOS game, is Windows-tolerant. It's sound support is pretty basic, requiring only a Sound Blaster. It supports a wide variety of ISA sound cards, including the Sound Blaster Pro, Sound Blaster 16/AWE32 & 64, Pro Audio Spectrum 16, Roland RAP-10, Microsoft/Windows Sound System, ESS AudioDrive, Ensoniq SoundScape, Gravis UltraSound and Gravis UltraSound Max. It also supports the NewMedia.WAVJammer and I/O Magic Tempo PCMCIA sound cards natively. The game uses middleware drivers from HMI. In DOS, you shouldn't have a problem if you actually have one of these ISA or PCMCIA cards, or a card that advertises compatibility. Tomb Raider uses a sound card only for sound effects, and they are typically in an 8-bit/22kHz format (lowest common denominator, suitable for a pre-Pro Sound Blaster). In Windows 9x, DOS games can still access ISA sound cards directly. All the listed sound cards have Windows 9x drivers, and most are built into Windows 98SE. I am not sure whether there is a driver to obtain digital audio capabilities in Windows 9x for the Adlib Gold, only the FM Synthesizer may be supported. Owners of that card would be out of luck for this game. If you only have a PCI sound card, you will need to activate its DOS sound card emulation capabilities, if any. Most PCI sound cards for Windows 9x do emulate a Sound Blaster Pro, so if you have the emulation drivers installed in Windows 9x, you should be good to go. The Aureal Vortex 2 sound card works perfectly for this game, but you must set the resources manually in the setup program. Of course, you will need to use the Tomb Raider setup program to tell the game the virtual resources (I/O, IRQ/DMA) the emulation is using. You will need to run the game in Windows unless you have installed the drivers that provide real-mode DOS support for sound. The Tomb Raider PC CD is a mixed data/audio CD, with one data track and nine audio tracks. The audio tracks should be playable in a CD player or with Windows Media Player. If you can hear no music, make sure that there is an MPC cable connected from your CD ROM or DVD ROM drive to your sound card. You can also hear the music if you plug in headphones or speakers to the audio output jack on the front of many drives. Also, make sure your mixer settings have not muted the CD audio. There are some budget releases where the CD audio is not present. The Playstation version of the game is also a mixed data/audio CD but has fifty-six audio tracks. Additional tracks are used for all in-game spoken dialog, including the tutorial level. This dialog, recorded in 16-bit CD audio format, will sound superior to the 8-bit digital format the PC version uses. There are also additional Playstation music tracks that play back at certain points in the levels that are entirely absent from the PC version. On the other hand, the Playstation version does not have ambient music playing throughout the levels. Core Design removed these extra tracks from the PC version as a "design decision", according to the PC version's readme file. The theory behind the decision is that certain CD drives could not keep up with the frequent CD track changes. The patch will be found on the next page, http://www.vogons.org/viewtopic.php?f=20&t=10463&start=200#p117936. Included in the patch is a modified Voodoo Rush TOMB.EXE, but there are instructions to modify any Tomb Raider executable. Glidos also supports restoring the triggers through a downloadable pack. I have successfully used an original Playstation controller (no analog sticks) with a Radio Shack PSX to USB adapter (RS Part # 26-304) in Windows 98SE. The USB adapter will be seen by Windows 98SE as a generic HID device, and all the buttons of the PSX controller will be visible. You can also use a PSX Dual Shock controller. Tomb Raider for the Playstation was pre-Dual Shock and only supported digital axes. A standard PC joystick provides analog axes, but I do not believe Tomb Raider for the PC really takes advantage of analog degrees of movement. I would suggest mapping the more critical functions to the "real" DOS gamepad buttons (Action, Draw Weapons, Jump) and the less timing critical buttons to the "emulated" keyboard buttons. I found that if I used a Gravis Gamepad connected to my Vortex 2's game port, the control was unreliable with the Voodoo Rush executables. 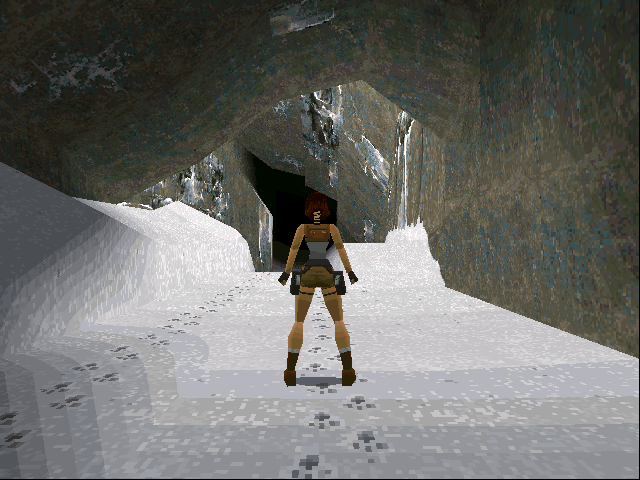 The menu would rotate uncontrollably and Lara would not run in a straight line without turning. This was with my Pentium III 600E running at 600MHz. When I reduced the speed to 400MHz by knocking down the FSB to 66MHz, the control was properly responsive. 1980s - 5200, NES, Genesis (and SMS by virtue of a Power Base Converter). Between the PC speaker and the DMA-driven Earlier music devices were generally programmable sound generators, essentially using variable frequency square waves and frequency modulated sine waves to produce sounds. None of them had natural DAC functionality. However, these could be tweaked to simulate the effect of a crude DAC. The PCjr. and Tandy 3-Voice chip, the TI SN76496 and its clones, was quite a bit more capable than the PC Speaker. It had three square wave generators as opposed to the single square wave of the PC Speaker. Additionally, it had a 4-bit volume control for the chip's output. This volume control, combined with one of the square waves, could be used as a DAC. The Game Blaster SAA-1099 chips operated very similarly to the Tandy chip (but with six channels per chip instead of three) and thus were also capable of using this method. The Adlib YM-3812 chip used two operator frequency modulated sine waves to produce sound. There are eighteen operators in total, and each could be manipulated via multiple registers. Each operator has a 6-bit volume control, giving 6-bit DAC functionality. Similar methods could be used to produce digitized sound as with the less-advanced devices. As a sidenote, these methods were also used for other, non-PC chips. Programmgers for the Commodore 64 used such methods to allow the MOS 6581 SID chip to produce an approximation of human voice for the classic game "Impossible Mission" and others. The impressive digitized sound effects of Dungeon Master for the Atari ST were produced solely by the high-clocked AY-3-8910 clone in that machine, the YM-2149. The Atari TIA (Quadrun) and POKEY chips could also handle digitized sound. All these chips have 4-bit volume controls like the TI and Phillips chips, so the same methods can be used to get digitized sound out of them. The NES 2A03 had a 7-bit DAC that could be fed directly by the processor and could also employ a delta modulation technique for digitized sound. There are several disadvantages to this method. First, the result will definitely sound "lo-fi" and is often very quiet. Second, it requires a lot of processor time, because the processor has to send a lot of data directly to the device to make it work faster than it should. Third, it requires much more space to store a sample than a chiptune, and in the era of 360KB and 720KB floppy disks, the room for digitized sound was limited. As far as PC games go, outside digitized PC Speaker, the effect was seldom used. An early use of the effect was in Imagic's Touchdown Football for the PCjr. It's digitized voice only played back properly on a PCjr., the faster Tandy 1000 would make the voice sound like a chipmunk. The game was later ported to Tandy 1000, and the voice played back at the correct speed. Interplay used it for the sound effects in the original 16-color version of Battle Chess. Epyx's Storm Strike uses for voice samples in at least two places. Capstone's Bill and Ted's Excellent Adventure utilized it for the Adlib, as did Interplay's/Delphine Software's Another World/Out of this World. Another World also supported the Sound Blaster, and the sampled sound effects sound far superior with the Sound Blaster. GameTek's Super Jeopardy supports Adlib for digitized music and it may also support digitized playback with the Innovation SSI-2001, which also used a MOS 6581 SID chip. Sir-Tech's Wizardry : Bane of the Cosmic Forge and Wizardry : Crusaders of the Dark Savant supports digitized sound through the Adlib, even if Sound Blaster is selected. The game also supports digitized PC Speaker sound, and in DOSBox, you must select PC Speaker sound. Crusaders allows you to select a music device independently of the sound device. Some games, like Budokan, support digitized PC Speaker for sound effects regardless of sound device selected. Dragon Wars is one of many games that supports digitized PC Speaker sound even though the Tandy 1000 and other sound cards were available by the time of its PC port's release. Activision's OmniMusic driver, used in F-14 Tomcat, BattleTech: The Crescent Hawk's Revenge and Joe Montana Football, support digitized playback with Adlib, Tandy and Game Blaster. BattleTech's PC Speaker digitized sound is more limited, because there is no voice in BattleTech whereas there is voice with every other sound chip. While DOSBox can support digitized PC Speaker music reasonably well, it utterly fails to render digitized Tandy, Adlib or Game Blaster music. Usually the result is muted, muffled or virtually inaudible. This is one area where you still need real hardware to hear the music and sound effects as the creators intended. Now that the Classic Doctor Who DVD line has just about come to an end, I think it is a good time to recognize the achievements of the range and the team that put it together. DVDs were a huge boon to TV series collectors and fans. For the first time, series after series began to be released on DVD. The smaller size of DVDs made it much easier to store on a shelf than large VHS tapes. Stores could stock many more titles on DVD than on VHS, and successful television shows can take up comparatively enormous amounts of shelf space. DVDs were better quality, easier to navigate and more robust over multiple viewings. Rewinding tapes was a thing of the past, a chore which no one regretted. Moreover, since many TV series had not been previously released, or were very expensive when first released, there was less of a feeling of rebuying all over again. Doctor Who, like Star Trek, was an early pioneer in releasing stories on home video. The concept of releasing a season or a series of a TV did not yet exist when the range was begun. Additionally, several episodes were returned to the BBC up until 1992, so the idea of a "Complete Season 7, 8, 9 10 or 11" was not yet feasible. There was a serious mistake made at the start of the VHS line, releasing stories in the "omnibus" or movie format. In this format, the cliffhangers and the credits in-between episodes would be edited together to form one movie-length story. With the 1989 release of The Daleks, this butchery ceased but the BBC never fully replaced the omnibus editions with episodic editions, especially in America. It took the BBC twenty years (1983-2003) to release all the available episodes of Doctor Who on VHS format. When the Classic Series ended in 1989, only fourteen stories had been released, most of them "movietized". The situation had become much improved during the next ten years. Roughly around 1992, a team of specialists at the BBC were able to re-colorize some Third Doctor stories by combining the color information from inferior NTSC color videotapes with 16mm black and white telecine recordings of the stories. What became known as the Doctor Who Restoration Team started with this success. 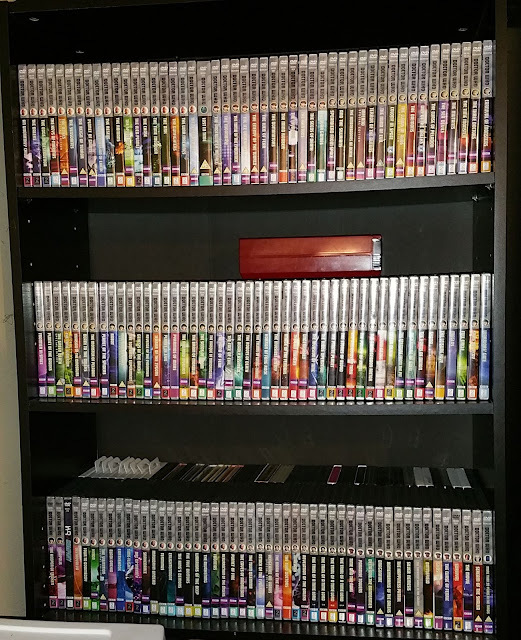 While its presence was visibly or invisibly noticeable on several VHS releases, it wasn't until the DVD range that the RT really became famous within fandom. In its attempts to restore the classic stores as much as possible, the RT really helped establish several breakthrough technologies. The first of course is VidFIRE, the process of restoring the fluid video look to telecines. This has been applied on virtually every First and Second Doctor DVD, often with spectacular results. Second must be Reverse Standards Conversion (RSC), to reverse the process where the RT only had NTSC videotapes that had been transferred from PAL in the 1970s. Conversions in the 1970s were crude and probably were little more advanced than repeating every fifth frame and dropping 100 lines. The RT fixed the juddery and jagged recordings originally made using RSC. Third is NTSC Telecine Colorization. If the NTSC tape quality was not sufficient for broadcast, as in a recording made off-the-air, then the color information from the NTSC video would be combined with the higher quality telecine and VidFIRE to make the best possible representation for the video. Fourth is Chroma Dot Recovery, where color information could be decoded by dots recorded by the telecine, even though it was recording a black and white TV screen. This allowed for the pain-staking process of colorizing several B&W telecine episodes where no color video survived. Fifth is using high quality scans of the original negatives of the 16mm and 35mm inserts when available. This method was used to clean up the titles of the Second through Sixth Doctors, and in stories where the original filmed inserts were available, these dramatically improved the picture quality over the actual inserts recorded on the video. Sixth is the recreation of the title and end credits, eliminating fuzzy and crooked text with properly sharp and solid text that the viewer would have originally seen on broadcast. No videotaped series has anything near the restoration work that a long-running show like Doctor Who has seen. Videotape restoration would appear to me to have been a very neglected field of study. Part of the reason is due to the fact that videotape was widely seen as inferior to film and relegated to budget shows with artistic merit to match. Another reason is that restoration is costly and time consuming; in the DVD age, production companies want to get as much material as the public will buy as quickly as possible. Videotapes and telerecordings/kinescopes are often not in the greatest shape to begin with, so the material that a restorer would have to work with is not particularly inspiring. The DVD medium is as close to an ideal format as has yet been devised to watch a TV show like Doctor Who. While not suitable for losslessly compressed video, the format's 720 pixel horizontal resolution notably exceeds the ~400 horizontal pixel resolution of analog tapes on which it was recorded. The format has the capability to make the episodes look as good as they are likely to ever get. The RT has improved their transfers over the years, as demonstrated with the Special Editions replacing early DVD releases. When counting for the Special Editions, it took the BBC only 11 years (it would have been 10 without episode discoveries) to release all Classic Doctor Who serials to DVD (2003-2014). As the range has more-or-less reached its end, the resulting corpus is very consistent. There are remarkably few errors to speak of despite the vast amount of work required to get these episodes in the shape that they were presented on the DVDs. There are no embarrassing gaps with only omnibus-releases; off-air-recordings of repeated stories in the serial format may be better than the official VHS releases. The improvements of the DVDs over VHS are obvious to anyone, even if they have to be shown an A-B comparison. However, there are more than just the stories to consider. Every story has subtitles and most have audio commentaries, sometimes more than one. The sheer amount of extras reminds one of the phrase "an embarrassment of riches." Most DVDs include extras like scans of Radio Times listings for the story, making-of-commentaries, restoration documentaries, spoofs, parodies, deleted scenes, out-takes, alternate edits or CGI effects, optional "movie" versions, rare production photos and other behind-the-scenes materials, interviews, trailers and continuity announcements, the list goes on and on. Region 2 releases always had a liner-note card that summarized the features and gave some story background. Special features were rare on VHS releases. Other series released on DVD generally do not possess the breadth of special features that the Doctor Who DVDs can boast. Physically and aesthetically, the DVDs are very satisfying. DVDs weigh less than VHS tapes and take up much less room. Each story has its own DVD case and cover, even if it was only released in a box set. Stories with two and three discs take up as much room as a story with a single disc (with one exception, Lost in Time). Stories can be stacked in broadcast order without difficulty and can fit snuggly into three shelves at least 7" tall and 28.5" wide. By contrast, due to the pairing of certain VHS (The Daleks 30th Anniversary) stories in the same box, you could not completely sort by story with using the retail boxes. Also, the plastic DVD cases are less likely to show visible shelf wear than the black cardboard VHS boxes. The cover design and the disc menus have been consistent since 2001. While buying individual stories or thematic box sets is something of a pain, the BBC deserves great credit for releasing Classic Doctor Who with a great deal of respect for the show. It could easily have taken a "just get it out there", cash-in mentality to the range. It has devoted substantial resources to the show post-cancellation, and the returns were not guaranteed. It (and by extension the U.K. citizens who pay for their television licence) spearheaded research into restoration techniques and the production of special features. Here I add my own small "voice" to the praise which the line so richly deserves.